The Fan Shroud surfaced again when we are introduced to Moses for the first time in the book of Exodus. The Pharaoh decried that all newborn sons would be thrown into the river, yet all daughters would live. This is sort of the opposite of China. Levi's daughter bore a son, and upon seeing he was a goodly child, hid him away for three months. After three months should could no longer hide him and instead built him a baby ark of bulrushes, and daubed it with slime and with pitch and installed a Fan Shroud cover, and put the child therein. Pharaoh's daughter went to the River Nile to wash, accompanied by her maidens. I would imagine the maindens were there to get that area in the small of Pharaoh's daughter's back that is just too far away to get when you put your hand over either shoulder and you just can't get leverage by just twisting your arm around your waist. Maidens would make washing that spot a lot easier. 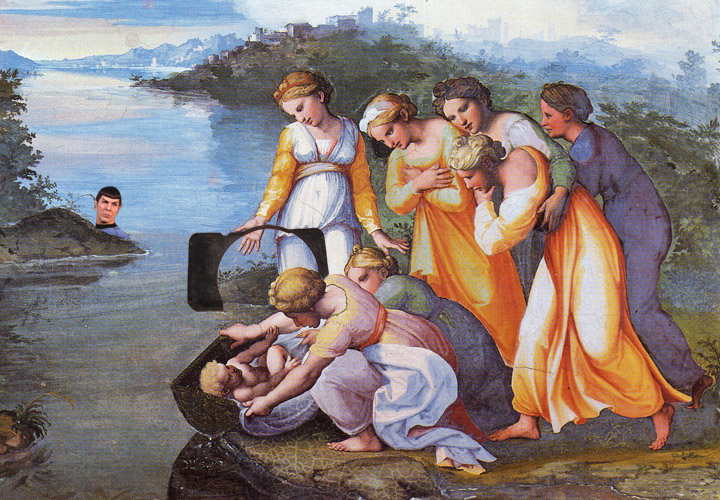 In his painting "Moses found by Pharaoh's daughter along the Nile", 16th century painter Raphael depicts the scene of baby Moses in his baby ark, as discovered by Pharaoh's daughter on the River Nile.